Baby Steven is a sweetie and of that there is no doubt. He has captured the hearts of everyone at the village. Baby Steven was born at the beginning of last June. Soon after delivery, his mother died due to a haemorrhage that could not be controlled. The only person available to look after the new born was his elderly maternal grandmother. However, she was not really in a position to look after a baby. Elderly and impoverished, she eked out a living by selling 'kaschasu', a 'home brewed' gin that is popular amongst the poorest villages in Malawi. The old woman had no resources to look after a baby and little Steven soon became malnourished and grew weaker and weaker. The community in the village eventually became aware of the poor conditions that baby Steven was living in. They tried to look for the baby's father but could not find him. Eventually, in an effort to help the baby, they launched an appeal on Malawi radio and television for public sympathy and action. 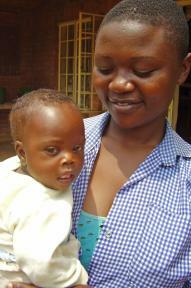 'Ngati mwanayu sathandizika ndithu amwalira' - if this child is not helped he will not survive. He will die. Co-workers at SOS Children's Villages Malawi heard the appeal and approached the local Social Welfare Office. Following many meetings between co-workers and the baby's grandmother and social workers, it was decided that the baby should be taken into the care of SOS Children's Villages and should live at SOS Children's Village Lilongwe. In September last year, baby Steven finally arrived at the village to be welcomed 'home' by everyone. Journalists from Malawi radio and television joined the party as they had been following Steven's story in the months of negotiations. The following day, Steven's 'homecoming' was broadcast throughout Malawi and messages of goodwill flooded in from all over the country. This public 'homecoming' was seen by millions, but for Steven, the long-term benefits of living at SOS Children's Village Lilongwe will be characterised by the love of everyone close by - at the village and especially his new 'SOS family' of his SOS mother and his SOS brothers and sisters. Tiny, underweight and malnourished, everyone was concerned for Steven. But he is a tough little nut and with the loving care of his SOS mother he gradually began to put on weight as he was put on a special diet by the nurse at SOS Medical Centre Lilongwe. It was on a visit to the clinic that baby Steven was seen by the director of the SOS Medical Centre rehabilitation unit. He immediately noticed physical indications that Steven had Down's Syndrome and this was confirmed by the doctor at the medical centre. Steven has since begun early childhood intervention therapies so to maximise his potential. He attends physical therapy to help with his muscle tone and play therapy to stimulate his mental capabilities. Steven has grown to be a very smiley baby who touches the heart of everyone who meets him. Thanks to the intervention of SOS Children's Villages, Steven can now look forward to a happy life where he can grow up surrounded by love, care and attention from a community that has his best interest at heart.